Place gear #22 flat on table with the teeth pointing in an anticlockwise direction. Lock together with steel pin #23 (1/2 inch long). Place (4) clutch dogs #25 around the clutch cam #24. Press rubber "O" ring #28 firmly into pulley #29 pocket. Remove brass shaft #12 from backboard #1. Place the pulley #29 with "O" ring side down, on table. Push the non-knurled end of shaft #12 into pulley #29 and through "O" ring. still seated in pulley pocket. Slide clutch cap #27 onto shaft. Lock pulley and clutch cap together with (1) steel pin #23 (1/2 inch long). Attach clutch ring #26 to clutch cap #27 with (2) steel pins #23 (1/2 inch long). Place this assembly onto gear #22 over clutch cam #24 and clutch dogs #25. Assemble (1) spacer #17 and (2) nylon washers #13 onto bottom of shaft #12. Place assembly onto backboard #1. Push gear #30 onto shaft #12 against pulley #29. Insert key #31. Press into place. and file the tab to suit. Assemble washer #32 on brass shaft #12. 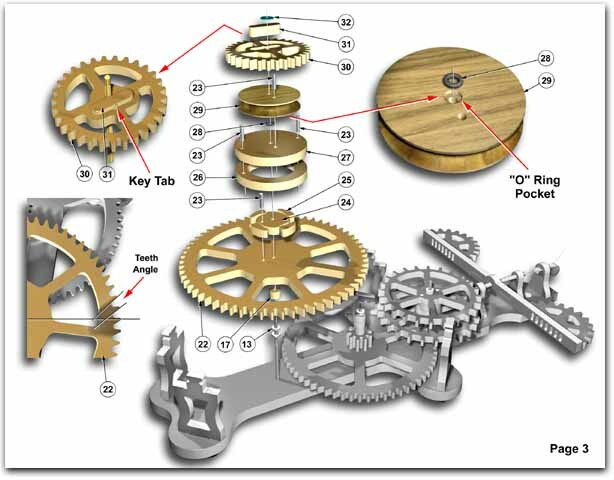 Check if gear assemblies rotate freely, then remove top plate.